Moneywort or Creeping Jenny, Creeping Joan, Wandering Tailor, Wandering Sailor or even Meadow Runagates, these latter, all referring to this plant’s habit of distributing itself by sending out long tendrils with a pair of rooting buds at the end. The plant dies back at the end of the growing season then, when the next opportunity for growth occurs, a new plant springs up at this point. It has become so used to spreading itself about in this way, that it often can’t be bothered to produce any seed, even though its flowers may have been fertilised. The Spinning Jenny is often thought to have been named after either, one of James Hargreaves‘ daughters, or perhaps his wife. Unfortunately, according to the parish register, none of his daughters nor his wife were named Jenny. Around that time a ‘gin was a common corruption of an engine, and this colloquialism was applied to any vaguely mechanical device. Could it be perhaps, that we have a Creeping Engine? 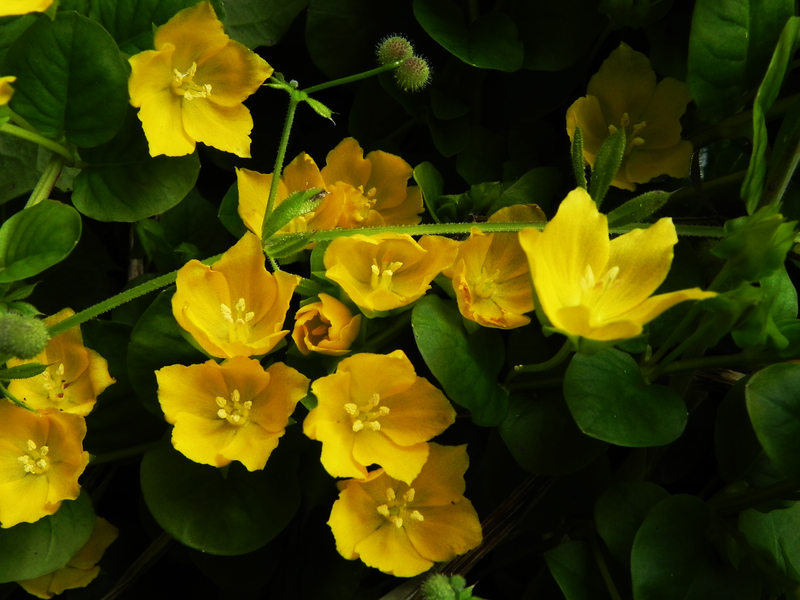 Moneywort, on the other hand, goes with the plant’s other names, such as Tuppenny Grass or Herb Tuppence. The shiny, green leaves are quite broad and short, with only a small point at the end. Moreover they are arranged along the stem in pairs, looking quite like a string of coins. Herbalists recommended it for healing wounds both inside and outside the body. In fact it was so good at healing wounds, that it was said, even serpents would use it. Perhaps if they bit their lip?